A magnificently weightless sleep experience brimming with innovation. •	Adjusts effortlessly to tiny movements. •	Beautifully designed with brushed aluminum finishing and double side stitching. •	Three individual Hästens Spring Systems provide full body support. •	You and your partner’s body movements are entirely isolated. Please, fill form below and leave comment or question for product. The Hästens 2000T completely redefines the definition of a bed, delivering a sleep experience that is simply, well, beautiful. This bed was designed to adjust effortlessly to the tiniest of movements and sleep position changes, all of which remain isolated so your partner can sleep just as soundly as you will when either of you move around. This incredible support is provided by a trio of individual Hästens Spring Systems working together to support the entire body. A fusion of elegance and comfort, with the 2000T, you’ll experience an unbelievable sense of wonderful weightlessness. The apex of our knowledge, craft and experience - brought together in what we proudly call the consummate bed. 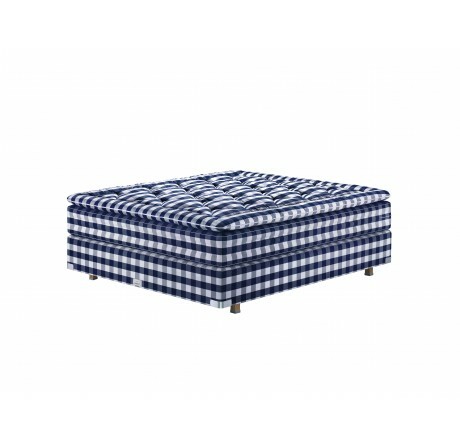 To lie down on a Hästens 2000T bed is to rest on Hästens’ entire history. The bed is the culmination of what we have learned during our 166-year quest for the best sleep possible: from profound insights into the human body and unique knowledge of materials to ﬁve generations of craftsmanship. It contains 34 layers and over 200 kilograms of carefully selected natural materials. Each individual layer is well thought-through and reﬁned practically down to the last horsetail hair. We want to give you the very best possible sleep quality, night after night. Plus the energy you need to be the best version of yourself, day after day. Three separate spring systems act together to give your entire body the support it needs. The bed adapts smoothly to your movements and small changes in sleep position, while your sleeping partner remains undisturbed. The history of Hästens 2000T is one of constant reﬁnement. For instance, in recent years we have partitioned the horsetail hair into more and thinner layers, with even thinner layers of cotton and wool between them. They are artfully assembled by hand. Our master craftsmen use experience to guide them as they carefully rufﬂe the fibers together. As you might guess, this requires a signiﬁcant investment in time. However, this age-old technique is well worth the effort. The goal is to produce the dream-like, airy, and pliable feel of a Hästens 200T - making it quite simply a masterpiece of comfort. - 4 layers of hand-teased A-lyx horsetail hair. ~ 10 layers of cotton and wool. act individually and never hook into each other. --Reinforced edge springs along sides, to prevent "
pressure from your body over the entire surface. - 1 layer of hand-teased A-lyx horsetail hair. - 2 layers of cotton and wool. finger joints, 16.8 cm high. - Stylish corner fittings in brushed aluminum. - 1 personal nameplate (can be engraved as required). 2 layers of bolster fabric of outstandingly durable virgin cotton. 2 layers of cotton and wool. 2 layers of hand-teased A-lynx horsetail hair. 1 layer of cotton and wool. Your Body is unique. You can be too. 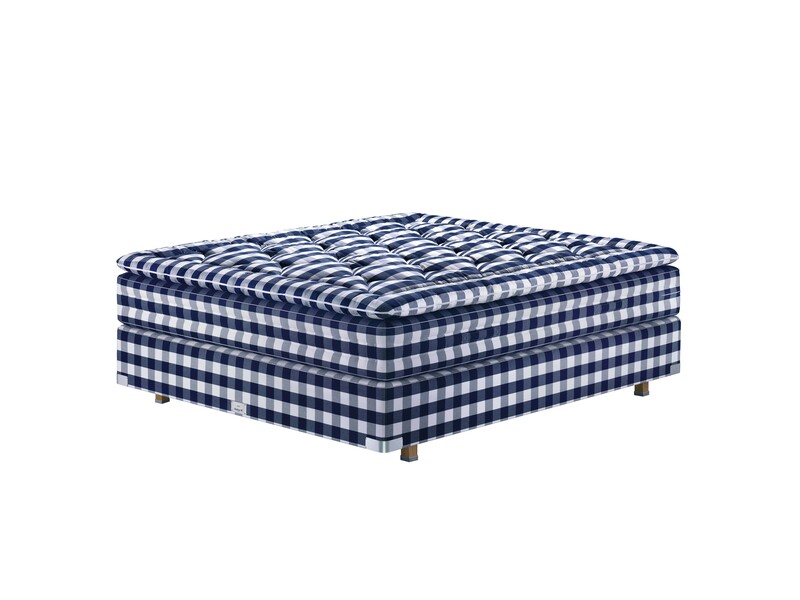 You can customize your Hastens bed so that it’s just right for you. There are over 20,000 possible combinations. Find out more on pages 234-279. Adjust the length and width in 0.5 cm increments (maximum size is 400 cm). Full base of split base. Square, rectangular or round shape. Choose between 15 different original fabrics. 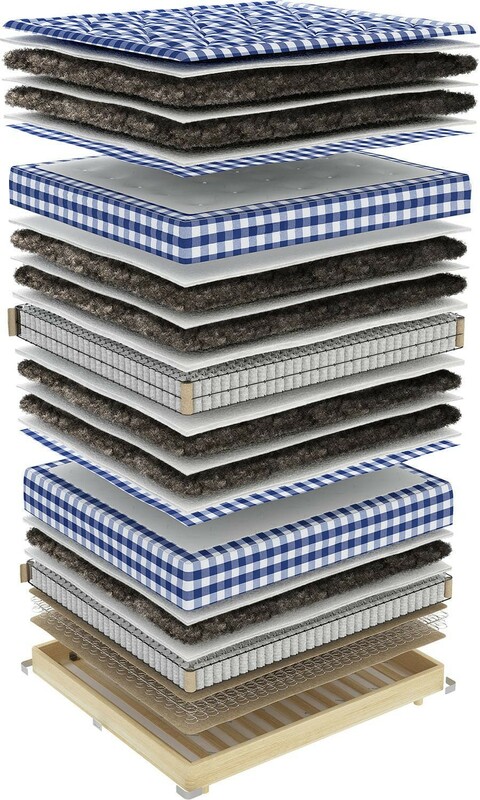 Top mattresses, headboards, legs, bed skirts, pillows, down quilts, bed linen, etc.